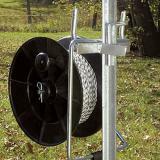 Easily attach these handy brackets to either wood or steel T posts to hold reels of conductors. 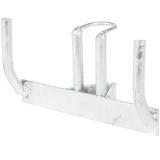 These brackets hold Premier's EzeReel™ or EzeReel™ XL complete spools. 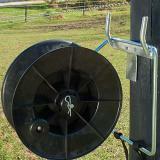 For attaching EzeReel or EzeReel XL complete with support frame, to wood post or steel T post. Quick way to end your fence line. You can hang the spool on the post and not have to terminate the conductor. Requires reels with hardware in order to use these brackets. 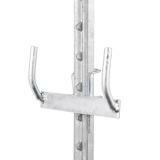 Attach bracket to wood post at desired height using 2 screws or nails (not included). Hang EzeReel's metal support frame over the 2 upright fingers of bracket. Remove the 2-prong portion of bracket that is shipped inside the triangular piece. With the finger-like projection of triangular piece pointing up, slide the triangle over top of T-post and position at desired height. Place the triangular bracket so it is positioned between 2 studs on front of post. 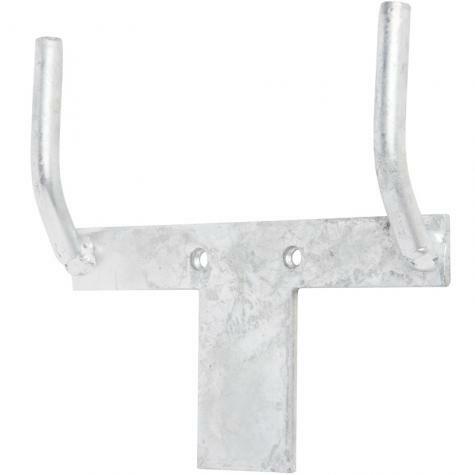 Hang the EzeReel's metal support frame over the 2 upright fingers of bracket. Good product, but with some downsides. The description could be better. 1) the locking pins are not attached and easy to lose. I added cable retainers- who wants to lose one in deep grass? 2) for most users, these require a dedicated T post as they slide down from the top. 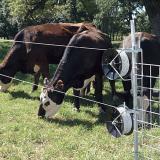 3) if you have an existing T post fence, the reels will hang on the wire without these. Easy to install and holds the ez reels well. I tried to rig up some wire to hold them and that was a failure. I gave in and bought these. I thought they were too expensive but they are quite heavy duty and well galvanized so should last a long time. well engineered, strong product. I don't anticipate ever having to replace these reel brackets, just buy more as I add more reels. I love keeping my fences clean and tidy, and the EzeReel brackets are the final touch to keeping my fence rows dynamic and easy to manage. I'll be purchasing more of these! Great little contraption. Easy to use and secure.